With no major weather system impact, Tamil Nadu continues to be under Cold and dry weather today too. Western and Northwestern Tamil Nadu Interiors would experience a slightly colder nights while coastal and South Tamil Nadu would have a pleasant daytime temperature and cold nights. A few odd showers might give a surprise to parts of Delta districts and extreme southern Peninsular districts today. Meanwhile Northern and Northeastern states would be blanketed in foggy weather today as the western disturbance over Northern India is bringing very cold air over them and causing temperature inversion. Keaweather wishes a Merry Christmas to all readers! 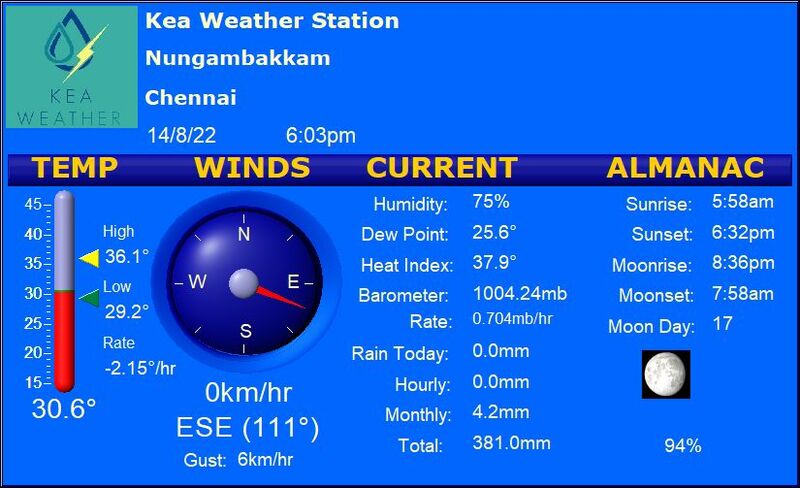 Chennai – Partly cloudy day with a maximum temperature of around 30 degrees and a minimum of 23 degrees. Coimbatore – A partly cloudy day and a colder night is expected with a high of 29 degrees and a low of 18 degrees. Madurai – A Partly cloudy day on cards with a max temp of 30 degrees and a minimum of 20 degrees. Tiruchi – A Sunny day is expected with a High of 30 degrees and a low of 21 degrees. Vellore –Partly cloudy day with a chill night is expected with a Max temp of 30 degrees and a Min of 19 degrees.